Ultradome repair, Speeddome Ultra repair, Pelco Repair, Pelco	DVR repairs including their DX series of DVR's, Pelco Spectradome repair, Sensormatic American Dynamics Repairs, GE KALATEL Repair, Dome	Camera repair, Matrix Switchers, Multiplexers and more. Brands serviced are - American Dynamics, Axis, Avigilon, Honeywell, Hikvision, Digital Watchdog, ExacqVision, Sensormatic, Pelco, Ultrak, Bosch, Philips, Burle, GE Kalatel, Vicon, Dedicated	Micros and more. BX2 repairs, DS2 repairs, SD Advanced repairs, ECO repairs, and all other models of Dedicated Micros DVRs. When servicing Dedicated Micros DVR's, we will replace and upgrade your software to the latest version so you can be sure your unit is up to date. We can also upgrade your storage capacity	to fit your needs. 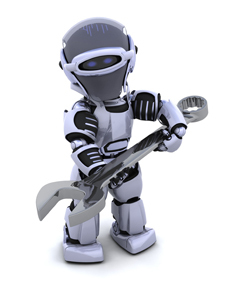 CLICK HERE FOR MORE INFORMATION ON BX2 REPAIRS AND UPGRADES. 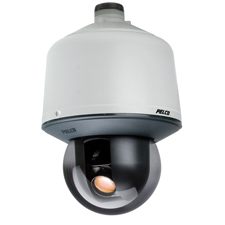 We offer repair services for various brands of robotic PTZ Dome cameras. Our repairs will include general preventative maintenance along with replacing any defective parts which caused the camera to fail. We will test the cameras if needed, on various control protocols to insure proper operation when you receive your camera back. We also soak test the cameras overnight or longer if needed to be sure they are fully functional. We have been in the business of PTZ camera repair for over 10 years now so we are fully equiped to handle most brands of PTZ dome cameras. Pelco Repairs include the inspection of all plastic housing and mechanical components and if it is warranted, we will replace all such plastic parts to insure the camera is in like new condition after servicing. Pelco Repairs also include preventative maintenance to the CPU motherboard to insure proper operation and the repair or replacement of the camera's power supply. All camera functions are tested thoroughly after servicing and the camera is set up for a overnight soak test. Sensormatic & American Dynamics repairs include the updating of the CPU boards firmware to the latest version along with preventative maintenance to the power supply and motherboards. All motors will be thoroughly tested for proper operation and replaced if deemed necessary. We repair the older style Speeddome 2000 Sensormatic dome cameras as well and are fully stocked with parts to repair those style of PTZ cameras. We repair the touchtracker and MegaPower Controllers as well that are made by American Dynamics. We repair most major brands of PTZ Dome Cameras so please give us a call if you have any questions. 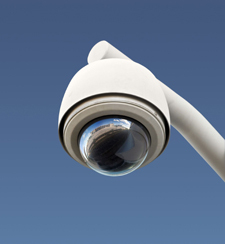 For over 20 years, Moore's Electronics has been in the business of repairing PTZ Dome cameras and fixed surveillance cameras. We have qualified electronic technicians who have extensive experience with all aspects of these cameras and will repair/refurbish your Axis IP camera to like new condition. 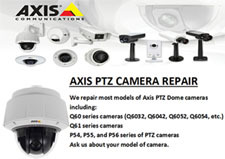 Axis has recently stopped repairing the older models of the Q60 series PTZ IP cameras including the Q6032 and Q6042 models of IP cameras. 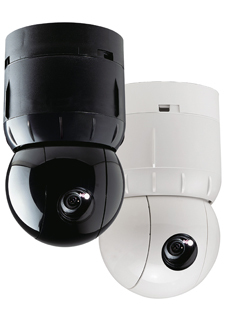 Here at Moore's Electronics we have extensive experience repairing these models of IP ptz dome cameras and can get your camera repaired and returned to you in a quick and effecient timeframe. Models Repaired Include: Q6032,Q6032-E, Q6034, Q6034-E, Q6035, Q6035-E, Q6042, Q6042-E, Q6044, Q6044-E, Q6045, Q6045-E, Q6052, Q6052-E, Q6054, Q6054-E, Q6055, Q6055-E, P54 SERIES P55 SERIES P56 SERIES Please give us a call at 800-349-2288 to inquire about your specific model of Axis IP camera.